Happy Friday! 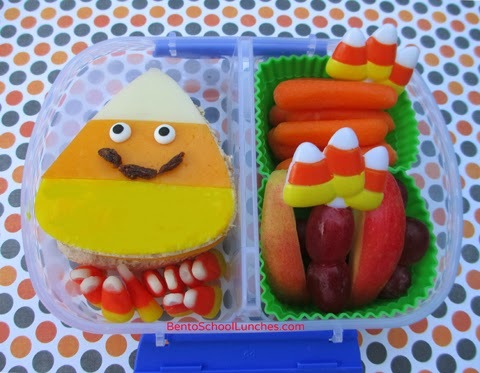 I woke up late and Nikolai requested for a candy corn bento this morning. I was happy to oblige and told him that I would have to make him a very simple one. Luckily, I found a couple of candy corn food picks in my Halloween bento supplies. This lunch took me only around 10 minutes to put together. :) I found one which I made last year and I am attaching it below. Have a great weekend everyone! Simple Sun -Butter sandwiches (stacked) decorated with candy corn cupcake picks. Applesauce with a pumpkin ring. Organic baby carrots. Packed in a Planetbox shuttle. 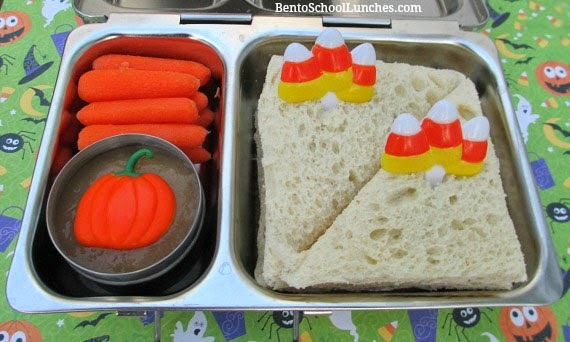 Last year's Candy Corn bento packed in his Sistema lunch box. Candy corn shaped sandwiches stacked, decorated with provolone, colby cheese and food safe marker. Candy eyes and raisin mouth added to make smiley candy corn. Apple slices and seedless red grapes. So cute! Love the smiling onigiri from last year's lunch too! Loving all the candy corn.. course I'm a candy corn addict, so there's that!